Daily Illuminator: Munchkin Shakespeare Play Events! November 28, 2017: Munchkin Shakespeare Play Events! Hark! What light through yonder window breaks? 'Tis an event, and Munchkin Shakespeare Deluxe the game. That's right: It's time for some bard-inspired events at a game store near you! Each session will feature demos or games of Munchkin Shakespeare Deluxe, plus plenty of promo cards and bookmarks with special Munchkin rules on them. As in any Munchkin game, you fight monsters and collect loot to reach Level 10 first – but in this version, all the monsters and treasures are Shakespearean! Fight the dreaded Two Bees . . . or the even more dreaded Not Two Bees. Protect yourself with the Tutu, Solid Flesh and trip up your enemies with the Fall Staff. If you like Shakespeary-in-jokes, these events are for you. Munchkin Shakespeare Deluxe Play Events are being held the weekend of December 1 (that's December 1, 2, and 3), so call your game store ahead of time to find out exactly when they're holding theirs. 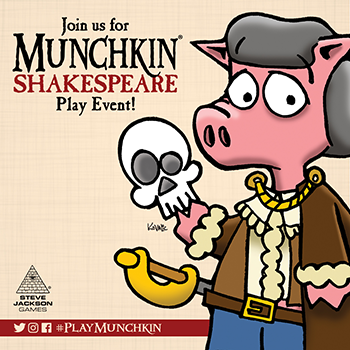 If you attend an event that week, you can enter yourself to win prizes if you post a picture of Munchkin Shakespeare Deluxe being played, with the hashtag #PlayMunchkin! Now, the curtain rises on: The list of locations!